Make sure to read the “details” section after you have reviewed the pricing. Please book your newborn session while you are still pregnant. Editing priority is given to those clients that book in advance. 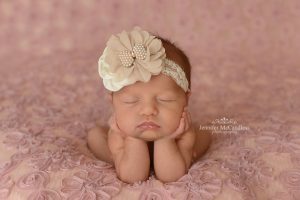 Newborn sessions are best when baby is 7-15 days old. 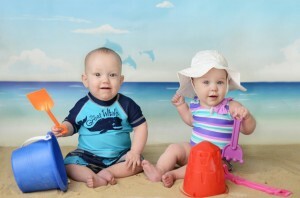 All newborn and baby sessions take place at 9am, M-F. When you get to the session I will do all the work, parents can relax and watch tv or take a nap. A parent prep guide will be provided to help ensure you have the best session possible. How much we get done will depend on how baby does and if directions are followed. Newborn contracts must be signed before the session. In a pinch? Ask about our affordable payment plans. Studio Tour ($75) – for those that would like to view the studio before their session and pick their own items out. We’ll spend 30 minutes reviewing what to expect and how best to prepare for your session. You’ll have the opportunity to select from a collection of blankets, headbands, props, backgrounds, and more. Hats/headbands are only available dependent on model release agreement with vendors. Otherwise you’ll need to supply your own hats, headbands, etc. Your baby will only be a newborn for a short time, so make your appointment soon and capture those milestones with beautiful, long-lasting memories. I like to have fun with my newborn photography and I enjoy keeping it fresh and unique! I’m not just a blanket photographer. I LOVE using props and being creative. If you are purchasing a session as a gift, please make sure to pass on my information to the recipient. Read the details at the bottom of the page to make sure you don’t miss anything! Please make sure that you have viewed my work and like it before you book with me. All images are the exclusive copyright of Jennifer McCandless Photography and Jennifer McCandless. I post images on Facebook, Etsy, my website and other social media sites. If clients do not want their images posted on social media, an extra $75 fee will be incurred. Deposits are non-refundable. Weekends are an extra $150, as I try to reserve that time for family. There’s a $25 reschedule fee for the first time a session is rescheduled. Please keep in mind that turn around times can be anywhere from 2-4 weeks depending on the time of year. If you schedule your session during a holiday week, there is a $150 fee. 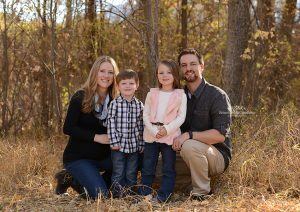 Family session pricing is available for up to 5 people (immediate family only). If you are purchasing a session as a gift, please make sure to pass on my information to the recipient. It is their responsibility to get in touch with me to set up their session. All family sessions must be setup within 6 months of being paid for. Gift certificates and sessions purchased as a gift must be used within 6 months. Cd’s can be purchased for an additional $35.